Reflecting the diverse, comparative and multidisciplinary nature of the field, Foreign Policy Analysis provides an open forum for research publication that enhances the communication of concepts and ideas across theoretical, methodological, geographical and disciplinary boundaries. 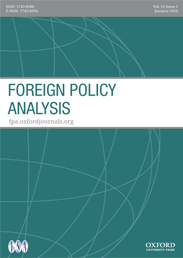 By emphasizing accessibility of content for scholars of all perspectives and approaches in the editorial and review process, Foreign Policy Analysis serves as a source for efforts at theoretical and methodological integration and deepening the conceptual debates throughout this rich and complex academic research tradition. The chemical weapons attack in Douma, Syria, on 7 April 2018 by the military forces of Bashar al-Assad, brought renewed calls for international action to protect civilians and resolve the brutal internal conflict that has persisted for over seven years and produced as many as half a million deaths. Despite calls for action by many Western governments, direct action and intervention have generally been in short supply, perhaps in part because Western observers do not perceive Assad as a particular threat or sufficiently villainous to warrant strong action. Given such calls, it is useful to review some of the most commonly proposed policy prescriptions for terminating conflicts or protecting civilian lives during armed conflict. Scholars have devoted substantial attention to understanding the conditions that promote interventions in foreign conflicts and to investigating their effects on violence. This literature can serve as a starting point for evaluating the relevant options available to policymakers interested in halting the bloodshed in Syria. The imposition of economic sanctions is a common punitive foreign policy, particularly among Western democratic states. Their advantage is that they impose costs on the target government but rarely endanger the lives of citizens in the sender. The expectation is that as economic costs on the targeted country mount, its leaders become more likely to concede to the demands of the sender. Existing studies demonstrate that multilateral sanctions, such as those imposed by the United Nations Security Council (UNSC), are substantially more effective than unilateral sanctions. So, any sanctions-induced change in the Syrian government’s actions would most likely occur only if the permanent members of the UNSC can agree to impose them, or if a sufficient number of members states can overcome the collective action problem and agree to impose substantial sanctions outside of the UN framework. The former seems highly unlikely given Russia’s support of Assad, and the latter is historically uncommon. Perhaps more importantly, the success of sanctions in this area is fairly poor. Previous studies suggest that the imposition of harsh economic sanctions can exacerbate human rights abuses and may inadvertently lead to an intensification of conflict. At minimum, targeted leaders often turn to predatory economic behaviors, including appropriating and redistributing property and wealth, to maintain their control on power, practices that often have a deleterious influence on the economic security and rights of their citizens. A second policy available to policymakers is direct military intervention. Armed intervention is an unpalatable, and therefore less common, option for hastening a conflict’s end or protecting civilians. Elected leaders are typically reluctant to become involved in foreign conflicts for humanitarian purposes because the public is often highly sensitive to casualties. Thus, even if an intervention were to save civilian lives abroad, rising causalities among the intervention force would rapidly dampen public support for humanitarian missions. The erosion of public support for US intervention in Somalia is the quintessential example of this effect. And as public support for such actions declines, so too does the willingness of leaders to maintain them. Of course, public support is partly shaped by the narratives and counter-narratives contrived and disseminated by activists and policymaking elites. Adept leaders that construct a compelling narrative for intervention are sometimes able to persuade reluctant publics to maintain support for such actions. What effect might such interventions have on conflict termination and the protection of civilian lives? Overall, the entry of additional actors tends to prolong ongoing conflicts. This is because additional actors complicate an already difficult bargaining process by expanding the range of interests that must be satisfied, and potentially widening areas of disagreement among the parties. Given the number of actors already involved in the Syrian conflict, the entry of new groups is unlikely to bring the war to a speedier conclusion. In terms of civilian protection, the effect of biased interventions—those directly opposing or supporting a specific side in the conflict—are unclear. While some studies suggest that biased intervention increase civilian victimization by the actor they oppose, other studies have found that interventions that directly oppose perpetrators of mass killing can effectively reduce the severity of such violence. …additional actors complicate an already difficult bargaining process by expanding the range of interests that must be satisfied, and potentially widening areas of disagreement among the parties. By contrast, multilateral peacekeeping missions appear more likely to help reduce violence and prevent its recurrence. Most previous studies conclude that peacekeeping missions are effective at preventing a return to violence once the sides have agreed to halt the fighting. The catch here is that despite numerous short-lived ceasefires, none of the actors appear ready to seriously consider participating in a comprehensive peace process. Nonetheless, peacekeeping missions, particularly United Nations Peacekeeping Operations (UNPKO), appear to have a net positive effect on reducing violence levels. This effect increases as international commitment to the peacekeeping effort increases. More robust UNPKOs—typically measured in terms of the number of troops committed to the mission by UN member states—are more effective at reducing civilian deaths both during the conflict and the often highly unstable and unpredictable period immediately following a peace agreement or ceasefire. The obvious snag in deploying a UNPKO to Syria is the unwillingness of the Russian government (and to a lesser extent China) to consider such actions from the UNSC. As long as these actors maintain their opposition to the deployment of a robust peacekeeping force, this option remains unlikely. Where does this leave policymakers who have an interest in ameliorating the daily suffering endured by the Syrian population? Unfortunately, there appears to be few effective options. Sanctions will most likely prove ineffective and may marginally worsen the situation. Interventions directly against the Syrian regime threaten to expand the conflict by potentially leading to confrontations between Russia and Western forces, which would undoubtedly prolong the war and exacerbate civilian suffering. A robust peacekeeping force appears to be the most promising option. The challenge will be convincing Russia that a UNPKO does not necessarily undermine its ability to pursue its strategic interests in Syria, which would likely require substantial and unpopular concessions from Western government, not the least of which is tolerating the survival of Assad’s government and return to the pre-war status quo in the country. Featured image credit: Helicopter photo by mrminibike. CC0 via Pixaby. Reed M. Wood is an associate professor in the School of Politics and Global Studies at Arizona State University.